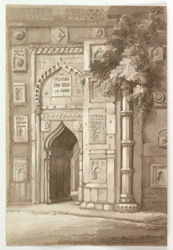 Sepia wash drawing of the entrance to the mosque at Hajipur by Harriot Mary Woodcock, dated November 1831. Inscribed on the reverse is: 'Ruined Mosque - Hadjipore'. Harriot was born in Calcutta in 1807, the daughter of Colin Shakespeare of the Bengal Civil Service. She married William Woodcock, also of the Bengal Civil Service, in Calcutta, 1828. This is one of twelve drawings of views and architecture made between 1831 and 1833 while William Woodcock was Assistant to the Magistrate and Collector of Tirhut, 1828-1832 and head Assistant to the Magistrate and Collector of Mirzapur, 1832-1834. Hajipur is situated in Bihar on the River Ganges just above it’s confluence with the River Gandak opposite Patna. The town is said to have been founded by Haji Ilyas Shah, sultan of Bengal between 1345 and 1358, who is also said to have constructed the fort here. During the Sultanate and Mughal periods the town was the headquarters of Bihar and played a large role in the struggles between Akbar and his rebellious Afghan governors of Bengal. In 1572 Afghan rebels seized the town but were driven out by Muzaffar Khan, one of Akbar’s Generals. Two years later a challenge was brought about by Daud Khan who took refuge in the fort at Hajipur which was laid siege to and reclaimed by Akbar’s forces. The town lost its importance after the transfer of Government to Patna. The mosque has a central entrance with an 'ogee' or curved pointed arch within a higher recessed arch frame.